Healthy crops are produced in Nature Farming, resulting from the combination of the power of healthy soil, vital seeds and cultivation in season, and such crops greatly contribute to our health. We consider crops having the following characteristics to be healthy. 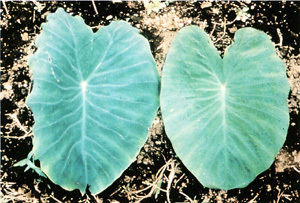 Leaves develop and grow orderly and evenly. Leaves are highly symmetric and have a bilateral or concentric consistency in veins and leaf angles. Leaves are softly thick, slightly smaller and erect and their colors are shining vivid green. Stems are slightly thick and not spindly. Roots are strong and abundant and spreading widely. The leaf on the right (Nature Farming) has symmetrical, orderly veins, while the veins of the one on the right (conventional farming) are disrupted and not symmetrical. The leaf on the right is healthy. Leaves on the left (Nature Farming) have mostly symmetrical incisions, while those on the right (conventional) have disrupted incisions. The leaves on the left are healthy. 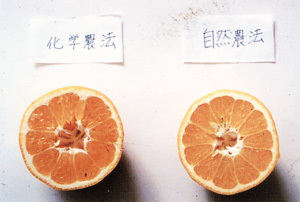 The segments on the right (Nature Farming) are even, while those on the left (conventional) are not. The Satsuma on the right is healthy. 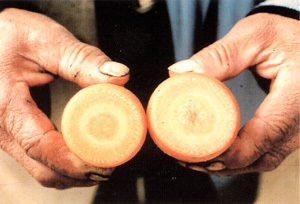 The carrot on the left (Nature Farming) has a dense core and a thick middle layer, which is full of nutrition, while the one on the right (conventional) has a swollen core. The one the left is healthy. Preserving crops grown in different farming methods for a long period show distinctions as follows. 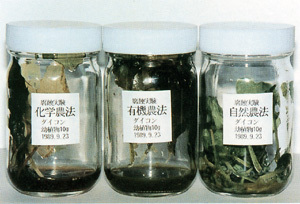 Leaves were preserved in sealed bottles at room temperature. 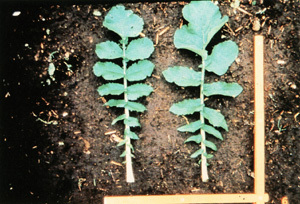 The leaves grown in Nature Farming (right) retain their original shapes, while those grown in conventional faming (left) and those in ordinary organic farming (center) have dissolved. Cut potatoes were left at room temperature. 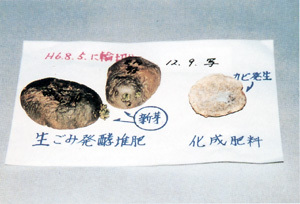 Potatoes grown in Nature Farming using fully fermented compost (left) remain vital and have sprouted, while potatoes grown with chemical fertilizers (right) have developed mold. Rice was cooked and preserved in sealed containers for about a year. Left: Rice grown with chemical fertilizers and pesticides has turned yellowish and has a pungent smell. 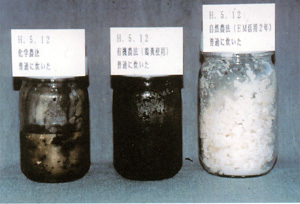 Center: Rice grown with chicken dung has turned blackish like feces. Right: Rice grown in Nature Farming (with bokashi, rice straw and EM) remains white and retains grain shapes. It smells like sweet sake made from fermented rice.